Target Species: Mata mata turtle Chelus fimbriatus, and Kaieteur golden dart-poison frog, Colostethus beebei. 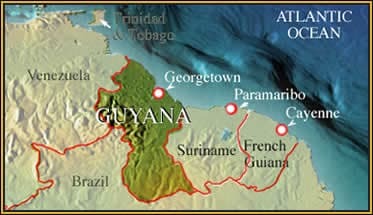 Location: Guyana is the only English-speaking, former British colony on the South American mainland (Belize is in Central America). In 1993 Mark conducted an herpetological survey in Guyana but now he has been invited back to investigate the herpetofauna of the huge Iwokrama Biological Reserve, one of the largest biological reserves in South America. Mark O’Shea is keen to capture, identify and photograph as many species of amphibians and reptiles as possible, including dwarf caiman in roadside creeks at night, but must take care of electric eels in the same locations. The quest to find and photograph two particular species, the Kaieteur golden dart-poison frog Colostethus beebei and the amazing Mata mata turtle, Chelus fimbriatus, takes him outside the reserve, first to the 720ft Kaieteur falls and then to Karanambo on the Rupununi River where American, Diane McTurk is working to conserve the giant 6ft (2m) river otter. 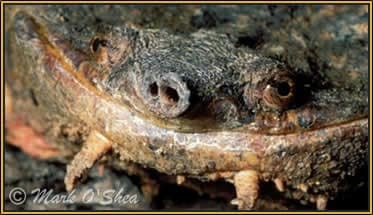 A foolish grin from the world’s oddest turtle, the Mata mata (Chelus fimbriatus), note the tubercles and proboscis snout.